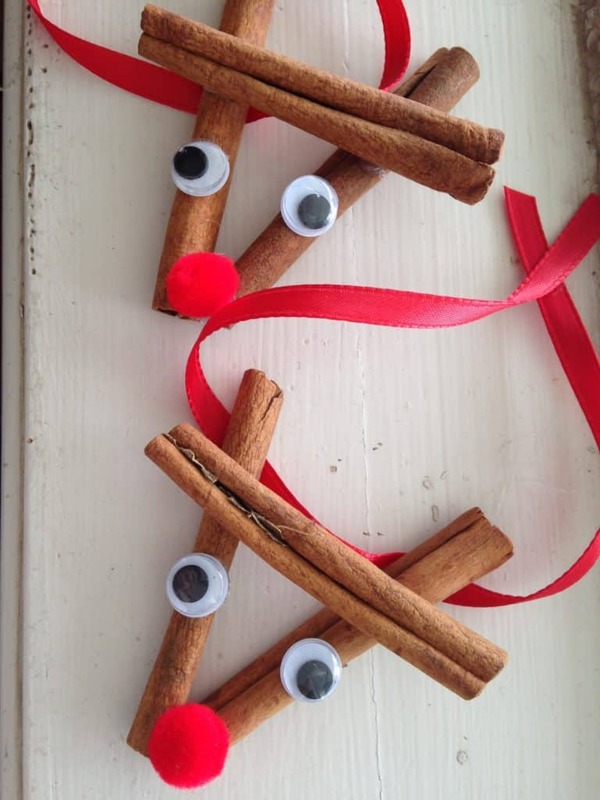 November 13, 2014 1 comment on "Cinnamon Stick Reindeer Ornament"
If you are looking for a quick, easy Christmas ornament or package topper for the holidays, these cinnamon stick reindeer ornaments are really cute and easy to make. You can make them yourself or have your kids make them with you. The above supplies will make one reindeer ornament. I suggest you look for cinnamon sticks in bulk, as they are much less expensive then buying them in a jar. I got mine at WinCo, and they were very inexpensive in the bulk section. You will need a hot glue gun to assemble these ornaments. I was going to have my son help me make these but I quickly realized that the ornaments are fairly small, and there is a lot of hot gluing that needs to be done so I decided to do it myself because he is not quite old enough to use the hot glue gun himself. 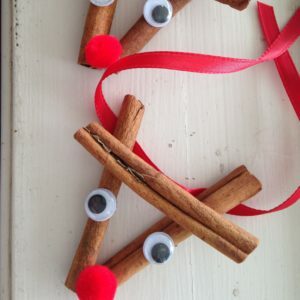 To form the reindeer, place two of the cinnamon sticks in the shape of a “v”. Place the third cinnamon stick horizontally on top of the “v”, towards the top. Hot glue all of the cinnamon stick together. Glue on the google eyes and pom pom for the nose. Cut a piece of ribbon for the hanger and glue it on the back of the reindeer. I also wrote the year on the back of the ornament with a Sharpie marker. These ornaments go together really quickly. It is easy to make a bunch of them at one time. I was really pleased with how they turned out. They are super cute and the cinnamon sticks make them smell great. They would be great on top of a Christmas present to give as a gift for the holidays. 1 Comment on "Cinnamon Stick Reindeer Ornament"